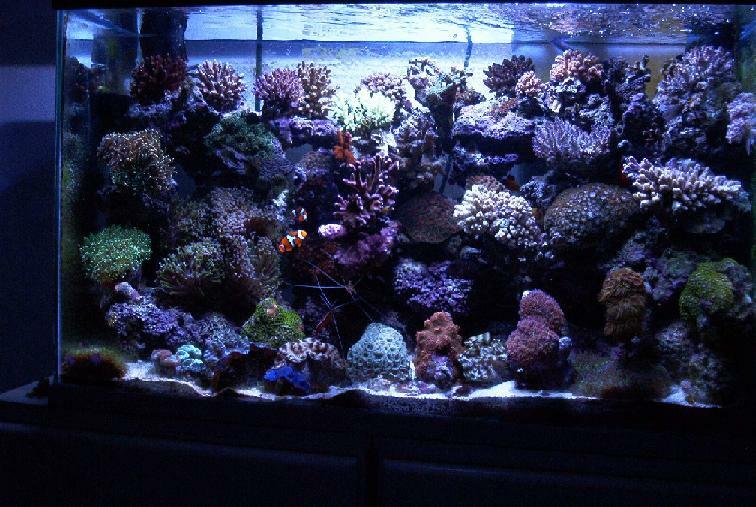 Question: What constitutes a reef tank? Do shrimp or live Fiji rock require special lighting? Shrimps don't require special lighting, Fiji rock does (sort of). For practical purposes (what else is there?) you want enough strength (intensity), quality (temp. like 5,000 K or higher, CRI 90 or higher) duration 10, 12, more hours per day... of pleasing (the affective domain) looking illumination... Depending on size, depth of your system and pocketbook, this can be (once again for our discussion here) some sort of boosted full spectrum fluorescents, compact fluorescents or metal halides.... Want more specifics? Need more info. on your end. What is A Reef Aquarium? Lighting? Filtration? What is a reef aquarium? A reef set-up can be defined in at least three ways; 1) by the organisms it employs and sustains, 2) it's refined equipment (in particular filtration and lighting), and lastly, 3) as a function of the high, consistent water quality the first demands and the second produces. Reef life is the a priori cause of why aquarists strove so long to ascertain just what it would/does/will take to keep such systems. The beautiful corals and several related stinging-celled animal groups, live algae, sponges, crustaceans, mollusks, the m?ange that makes up "live-rock" and "live-sand" and oh-so-many more used to virtually impossible to keep. My personal odyssey in the hobby, science and business of captive aquatic life spans the recent decades of these endeavors; the 1960's forward. I can remember whole tanks, indeed shipments of marine invertebrates "melting down" due to mysterious "water quality", filtration, lighting, who-knew-what reasons. Modern reef systems go beyond simply keeping the more delicate fish and non-fish life found on the world's reefs alive; they actually grow and reproduce them; often at higher than natural rates! Improvements in marine-aquarium keeping equipment get equal credit with livestock collecting and shipping techniques, and hobbyist knowledge as determinants driving reef interest. Especially, light fixtures and lamps/bulbs, and filter gear have allowed the successful maintenance of reef-life. More than new technologies developed for the ornamental fish industry per se, much of our innovations have come from borrowing from other fields. Magnetic-driven fluid-moving pumps with non-corrosive volutes, impellers, seals and shafts came to aquariums by way of the chemical-handling fields. True full-spectrum fluorescent lamps like Vita-lites ™, were introduced back in the sixties for indoor gardening and industrial uses. Similarly, wet-dry or trickle-filter applications are borrowed from turn-of-the-century municipal sewage-treatment principles. Regardless of where they come from, good ideas are good ideas; and these and many more have come to us from totally unrelated fields. A true oxymoron of reefs, wild and kept is their chemical and physical polar nature; they're both dynamic and homeostatic. Reef aquarists must employ all the tricks available to them; careful d?or selection, sparse , appropriate livestock with careful feeding, diligent maintenance… to provide optimized, consistent water quality. Due to their geographical positions and biota reef systems are typified as being "stable", "self-adjusting" and "nutrient-poor". The stereotypical reef habitat (there are several classifications of their diverse ecoclines) does receive a pretty regular amount of solar insolation, displays a narrow range of thermal variation, chemical make-up, and other physical factors. Such regularity is more than desirable in a captive reef environment; it is requisite. Temperature, salinity, pH, ammonia/nitrite/nitrates used to be the only water-quality testing concerns of marine aquarists. With reefs we've added reduction-oxidation, electrical current, ultraviolet radiation, phosphates, silicon, calcium, and more. What is "Reef" Filtration? Rather than any given technique, filtering for reef system's involves various strategies that result in homogeneous, clean, well-oxygenated water. Almost always, reef filtration includes vigorous, non-linear (i.e. chaotic) circulation, generated by one or more fluid-moving pumps and/or powerheads. Typical turnovers are several times per hour; there is no practical limit. Actual filter modes, media and containers are highly variable. Separate sumps/refugia, some fitted with wet-dry/trickle media, rock or sand, protein-skimmer/foam fractionation, re-dox/ozone/ultraviolet systems, calcium reactors, chemical contactors… There are many individual and confluent schools of how to go; Jaubert/NNR (Natural Nitrate Reduction), Berlin methods, electrical and chemical filtration modes… Canister, pressurized, high-tech, low-tech, no-tech… All with their own adherents and acolytes. Are any better than the others? You bet; depending on YOUR application, YOUR pocketbook, and YOUR penchant for tinkering and adjusting. Take a look through your livestock fish store (LFS; yes, another acronym), and the hobby literature. What's hot and available changes each issue. As a conscientious reef consumer, you are compelled to study up and keep current. Just "keep your eye on the prize"; remember, what you are seeking is the most consistent, high-quality water at the lowest hassle and cost. and have seen numerous examples of "live-rock only" systems in Indonesia and elsewhere in the intervening years, most reef-keepers will employ a protein skimmer, aka foam fractionator as their reef filtration principal component. Choose well. Just because it says "venturi" on the label, does not make a given brand, make or model better than one that is not. And, no, price is no good indication of value or relative functionality. Talk with your dealers and other practicing "reefers" (even if you're "out in the boonies", they're accessible via the internet); they are your best source of current, accurate, significant and meaningful information. Better "live rock" and sand is worth the cost. Which is which? Study and decide for yourself. Are all those meters, dosers and pumps necessary? No, but reliable testing and delivery gear can be of great service to those who will employ it properly. Just as with any tool, neglect or inappropriate use is worse than having none at all. There are only good pumps and powerheads, and "the rest"; you want only the former. One's that are adequately powerful pressure/volume wise, chemically inert, serviceable and reliable. What about light and lighting in the reef aquarium? Light is very important to reef life. Even for non-photosynthetic organisms the regularity of illumination is of consequence; much of their behavior and endogenous rhythms are tied to light cycling. There are three aspects of light that concern reef hobbyists; quality, quantity and duration. Photoquality is a question of the "kinds" of light; wavelengths principally. Some radiation bandwidths are toxic, such as far-end ultraviolet. For algae and livestock that harbors endosymbiotic algae, such as many of the true corals, sufficient light of certain wavelengths is necessary to drive the light reaction of photosynthesis. Photo-quantity is a matter of the intensity or brightness (apparent or not) of light. The number of photons is as important as their wavelength; not enough light, insufficient photosynthesis and way too little, everybody bumping into each other. Photo-duration is the periodicity of light cycling. Regular on-off light/dark periods are important, and easily achieved with simple to complex timing mechanisms. Gradually turning on and off some lighting is preferable to all on/off, and some sophisticated schemes can mimic diurnal sunniness, moonshine, even every now and then cloudiness! Happily, there are a few different methods of providing proper light to captive reefs. Most notably, metal halides (MH) and various formats of full-spectrum fluorescents (regular, high, and very-high outputs, compacts). These devices and some more novel types are utilized to provide reef set-ups with adequate quality and quantity light spectra. David; what do you think? Too simplistic? Is this about the level of information and reading level you have in mind? Am going to crank out my first feature for you in a few… how 'bout: Get thee to a Refugium? Okay!